Our Iftar table seems to be a manifestation of Barry Schwartz idea of paradox of choice; how having more options increases a consumer’s level of anxiety. Sometimes when you look at the food on the table and look down at your stomach, there’s an incredulity that you have to fill that (stomach) with that ? I have to say that it’s not that I am not grateful for the blessing of having a variety of food to select from. But the thing is, after the “attack”ing process, one feels really bloated and too lazy to finish taraweeh prayer. I don’t know exactly what happens in the kitchen when something is added to the to-be-cooked list but maybe the extra cooking is just a reflection of the hunger. You know how they say, don’t shop when you’re hungry because you’ll end up buying more stuff than you actually need? So my theory is, don’t decide on what to cook when you’re hungry because the menu will just go overboard…and notice I said, “don’t decide” not “don’t cook” when you are hungry because cooking while hungry is sorta inevitable. But it’s easier to set up tomorrow’s menu after Iftar and stick to the menu while stamping on the temptation to “add that one thing” and “add that other thing”. Isn’t this the month of curbing temptations after all? Today’s advise; Say no to Israaf. This entry was posted in Islamic, Mind and tagged psychology, Ramadan. In his lecture, “Man Yad3ooni” sheikh Mohammad Al3reify speaks about the importance of du3aa, and how we need to include it in our lives all the time. He encourages people to ask Allah (SWT) for anything and not limit ourselves because our minds can’t figure out how we’d get our wishes granted. What we deem as “impossible” and “unimaginable” could happen. Only recently we witnessed how ex-president-of-Egypt Hosny Mubarak went from president-to-prisoner, while Mohamed Morsi went from prisoner-to-president. This entry was posted in Islamic and tagged Islamic, Ramadan. 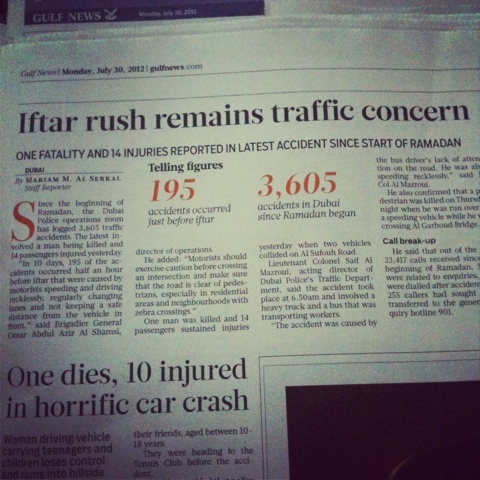 Fast and Furious During Ramadan? As the time for iftar approaches, the roads are nearly empty. Nearly. Maybe that’s why whoever is still on the road thinks he has the right to speed and break other road rules in order to reach his Iftar table on time. But trust me, the food isn’t going anywhere, so slow down. I’m happy to see that adnoc has taken an active role in spreading awareness about crazy driving in Ramadan. It put up an ad that talks about the issue and announces that when it calls for maghrib athan and you’re on the road, you can drive to the closest adnoc petrol station and you’ll be given dates to break your fast with. Now that’s what I call a socially responsible petrol station. Are you surprised the accompanying shop is called an “oasis”? This entry was posted in Islamic, Life Lessons and tagged Driving, Ramadan. You can make up your own list and add as many things as possible. Your in’shAllah list could include special duaa’s that you want to remember whenever you pray at night. The idea is that if you actually take the time out to make up such a list, it’s more likely that you will not forget illa an yashaa2 Allah. 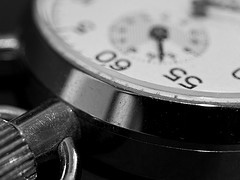 You can also have so many things that you would like to do but of course time could be a limiting factor so it helps if you actually divide your In’shAllah list into different sections and deciding which ones are high-priority, which ones are low-priority, and then focus on the high-priority tasks first. Overall dream big. It’s better to aim for the moon and land among the stars than reach for the lamp-post and hit your head against it. This is a blessed month and so we should always make duaa that Allah (SWT) will bless our time so we would be able to fill it with good deeds. Last but not least, remember to keep your intentions pure for Allah’s sake. This entry was posted in Islamic and tagged Islam, Life, Ramadan.